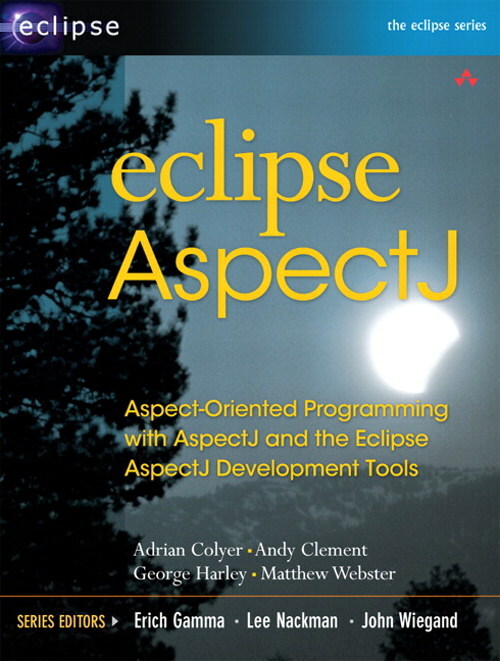 The AspectJ release documentation answers common questions and describes language and tool usage. Other publications about AspectJ address topics in AOP, and code samples demonstrate common idioms. If you are new to AspectJ, follow the trail proposed in the released documentation. The AspectJ 5 Developer's Notebook summarises changes made to the AspectJ language in AspectJ 5. These changes are not yet reflected in the programming guide. The AspectJ documentation package is included in the AspectJ download and linked below (both the most-recent released version and the next work-in-progress, as ). Parts are also included with the Eclipse AJDT plugin. For all contents, see the index . The Programming Guide introduces AOP and the AspectJ language: Getting Started introduces basic AspectJ semantics and shows development- and production-time applications. The AspectJ Language describes join points, pointcuts, advice, and inter-type declarations, all features new to AOP. Examples walks through the code in doc/released/examples ; Idioms and Pitfalls offer rules on things to do (or not). The Quick Reference summarizes syntax, but the Semantics appendix is the best reference for AspectJ usage. Javadocs for the AspectJ runtime API . Javadocs for the "Java 5"-only runtime APIs (reflection API and annotations). Javadocs for the AspectJ weaver API . The Development Environment Guide describes how to use the command-line compiler ajc , the Ant task iajc the documentation tool AJDoc the load-time weaving (LTW) support and the stand-alone AJ Browser . The AspectJ problem diagnosis guide describes the tracing/logging and dump framework. For a history of important fixes and new features for AspectJ, see the Porting Guide for upgrading from older versions of the language and the release README files for 1.5.0, 1.2.1, 1.2, 1.1 or the summary of changes . Books and articles we know of are listed on the Publications page. For our published tutorials and exercises outlining the rationale and concepts of AOP, the basics of the AspectJ language, and the differences from Java programs, see aspectj.org/modules/docs/teaching. (To get stuff from the CVS repository, see building source.) Spanish speakers might also be interested in "Programemos en AspectJ" at http://www.programemos.com. Find earlier project history, papers, and articles on the PARC project page. For a list of places to get example AspectJ code, see the FAQ entry on example programs. We collect and publish sample code contributions from community, including AspectJ programs and user-level trails for things like debugging AspectJ code or precompiling JSP's for Tomcat using AspectJ. Popular entries include reusable code for standard pointcut idioms and design pattern implementations.